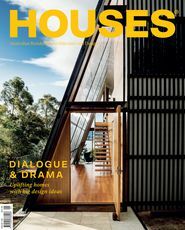 The Fabshack project in the Blue Mountains is a case study in prefabrication and minimizing waste. Working in the building industry for thirty-nine years, Mark Fullagar says he has seen a lot of waste – in materials, transportation, labour and time. 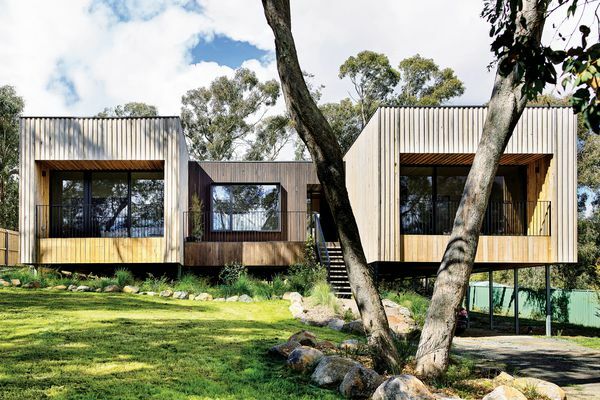 So when it came to building a compact and comfortable cabin for his twenty-six-acre property in Cattai, now an outer north-western suburb of Sydney, Mark minimized this waste with a prefabricated design. Ninety percent of the components can be formed offsite and transported in one shipping container and the cabin constructed within two weeks. Fabshack has been ten years in the making – designed, planned and built by Mark because he wanted to see what he could achieve without external influence. The cabin has a prefabricated structure that’s adaptable to different sites and uses and its distinctive curved form evolved out of function. 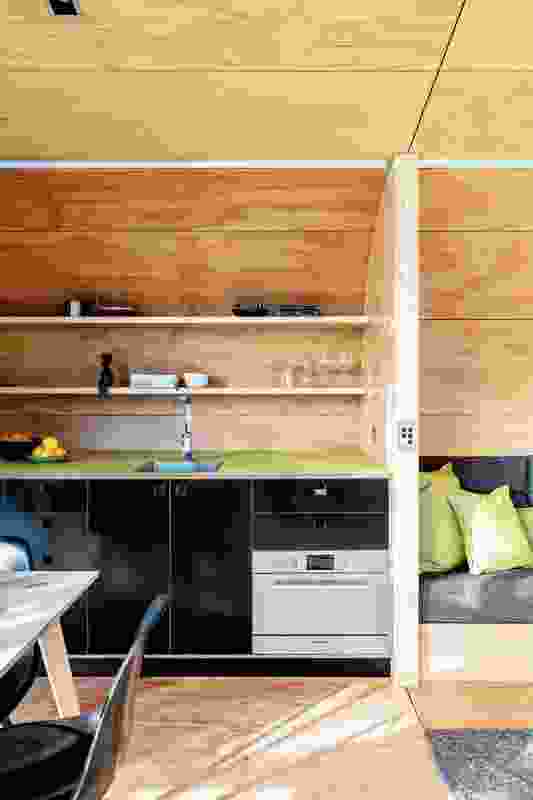 Facing west toward the Blue Mountains, Fabshack is fifty square metres in floor area and has a built-in queen-size bed, seating, storage, kitchen, dining, bathroom, laundry and deck. The structure comprises four 2.4-metre-wide bays, each consisting of six hollow-insulated ply panels that sit side by side within a steel web frame, elevated on ten piers. Each panel box is fully insulated and structurally strong enough to serve as both floor and floor joist. Insulated ply also provides the ceiling and curved wall at the rear of the cabin. Designed to catch drinking water, the roof form shapes the interior space. This curve developed from the need to collect drinking water and to remove leaves from the roof and gutter. Rainwater adheres to the curve as it flows down the roof into a gutter below, while debris drops off at its apex. 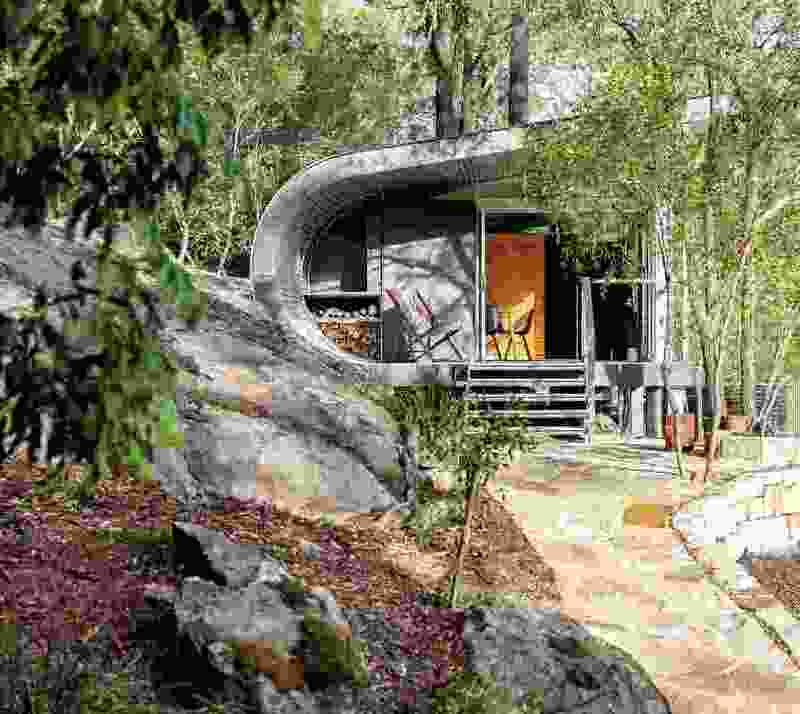 The shape also helps integrate the cabin in the site, as if allowing for the rocky outcrop behind, and orientates it for view and natural light. 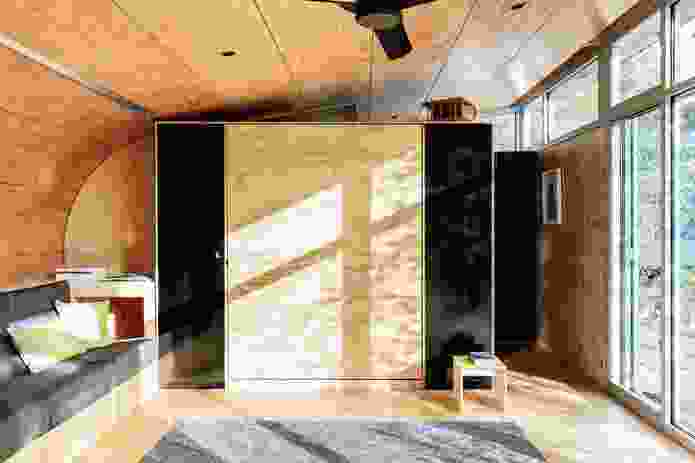 Inside, the wall sweeps into a raked ceiling that creates a sense of openness in the compact space. Large windows face west, with sliding exterior shutters and low-e glass protecting against the afternoon sun. Louvre windows allow for ventilation and a north-facing verandah encompasses an outdoor seating area. The curve also provides 1.2 metres extra width to the interior space. 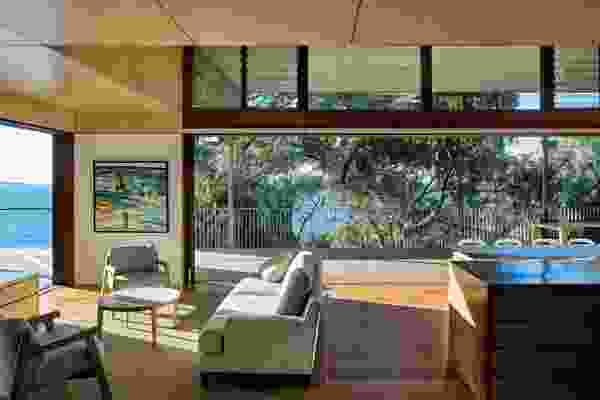 This allows for a kitchen with a deep benchtop and drawers, and for a built-in sofa with storage beneath and behind. The kitchen is fully equipped with appliances and storage and is spacious enough for a dining table and chairs. A recessed light extending along the junction of the wall and ceiling illuminates the kitchen, sofa and bathroom. The queen-size bed folds down from a joinery wall, which divides the living area and bathroom and has cupboards on both sides. 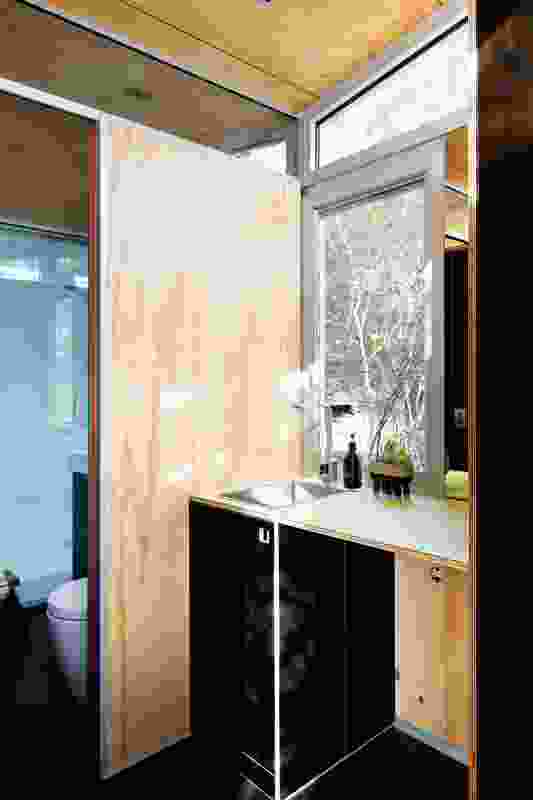 The bathroom has a south- facing window and the shower is positioned in the curve of the cabin. Mark designed the compact wood-burning stove to be more efficient than standard models – “to get more heat out of less timber,” he says. 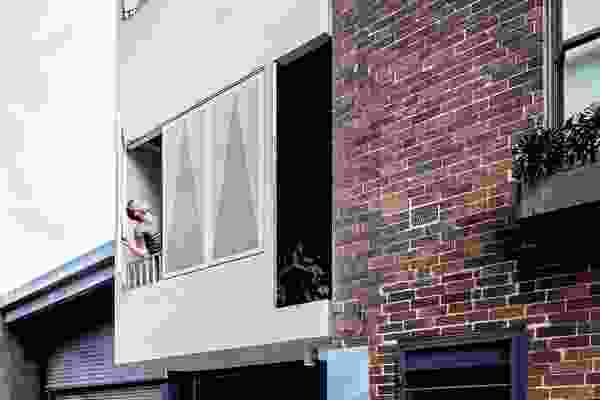 Standard building materials were chosen because they are cost-effective and non-combustible, given the location in a rural bushfire zone. 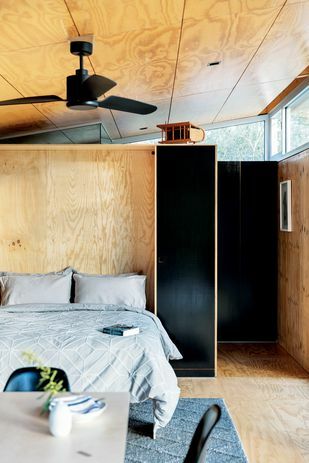 Radiata ply offers warmth and texture to complement the natural setting, with green linoleum benchtops and black joinery providing contrast and colour. The exterior materials, including corrugated steel, aluminium window frames and toughened glass, could tolerate up to BAL 29, but higher flame zones would require a change in some of the external materials. A fold-down bed is concealed in the storage wall that divides the living area from the bathroom. Mark prefabricated all the steel and ply components offsite and each is identical for ease of onsite construction. Cabinetry and plumbing fixtures were also constructed in the workshop, while the water and drainage system for the whole cabin was built into the back and bottom of the bathroom vanity, so that it just needs to be inserted and the plumbing hooked underneath. All the components can be packed into one shipping container – “rather than constructing offsite and transporting the modules on a truck, which means moving a lot of air around,” says Mark – and each component can be carried by one or two people to the site. 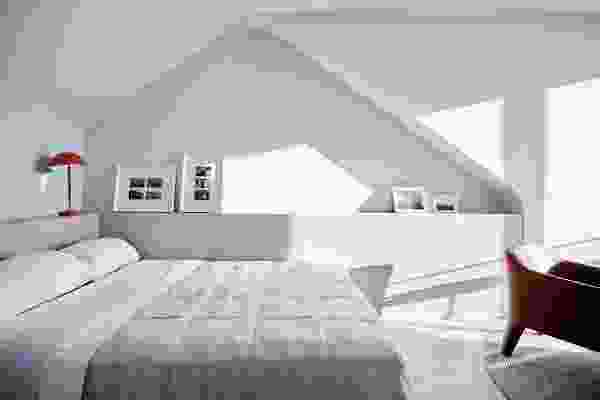 (Mark carried in all the structural steel and constructed the framework himself.) This not only minimizes transportation costs, onsite construction time and labour, but also means that components can be carried into difficult sites or down suburban side paths that trucks or cranes may not be able to access. Two people can put the cabin together in two weeks and it can be relocated, re-used or recycled by dismantling the components. The prefabricated modular design means that the cabin can be adapted for different sites, contexts and purposes. 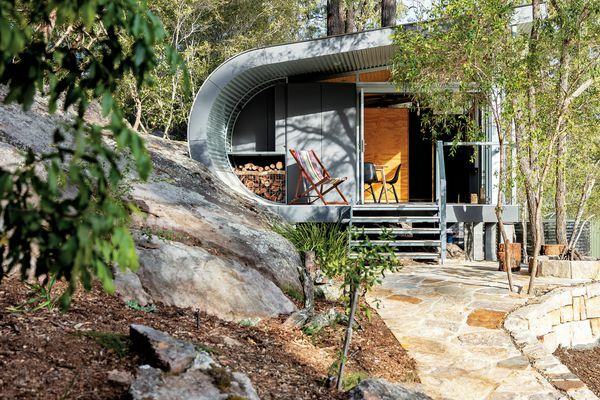 The length can be reduced or extended by 2.4-metre increments, the interior can be constructed as an empty shell or with a second bedroom, and materials can be upgraded depending on aesthetic, budget and bushfire requirements. Stramit corrugated cladding in Colorbond ‘Wallaby’. Stramit corrugated cladding in Colorbond ‘Wallaby’; James Hardie Scyon Matrix Internal walls: Radiata pine in Intergrain UltraFloor Satin. Radiata pine in Intergrain UltraFloor Satin. Forbo Furniture Linoleum Desktop in ‘Spring Green’; formply in black. Fibreglass shower module by the builder. Rocket stove and sliding window shutters by the builder. Ubiq Inex decking; split-faced sandstone flagging. The curve of the roof allows for a deep kitchen benchtop, drawers and a built-in sofa. The water and drainage system for the cabin is built into the back of the bathroom vanity.